At the opening of the film, Living in the Age of Airplanes, narrator Harrison Ford suggests that you “leave behind everything you know about airplanes”. While this may seem at odds with the title, it is indeed sage advice, for only with a blank canvas can one truly appreciate the significance of this film. We were all born into the age of aeroplanes and as such have grown to accept and expect all that goes with the forgotten miracle of flight. The golden era when we hoisted the likes of Lindbergh onto our shoulders has passed and given way to a time where aeroplanes are seemingly more a source of frustration if queues are too long and delays impinge on our plans. We have forgotten that man’s journey took 200,000 years to migrate across continents and nearly as long to increase our average speed to anything above walking pace. Straddling the globe within a day is now our expectation and the wonder has been lost for many. This latest film by Brian Terwilliger reminds us of that miracle. 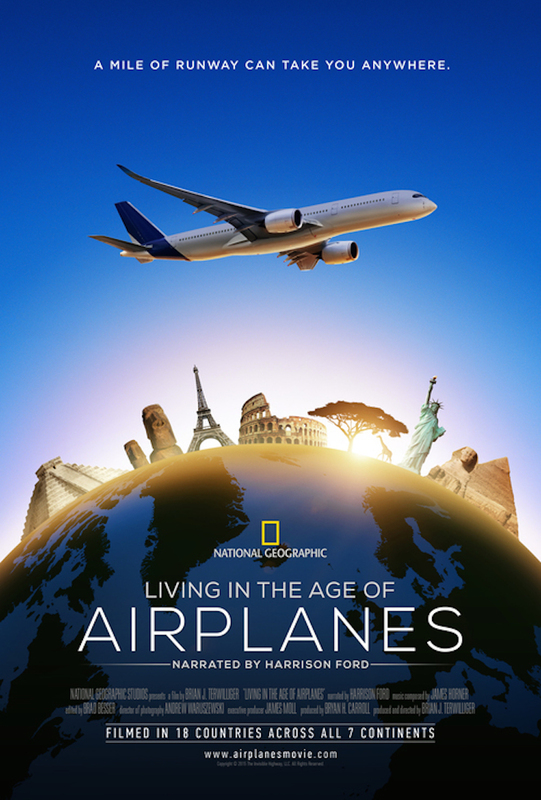 Set to amazing cinematography, meaningful narration and an emotive soundtrack, Living in the Age of Airplanes was filmed in 18 countries and across all seven continents. It cleverly highlights the role of aviation in our lives as both humankind and as individuals. It is a film that both educates and emotionally connects with the audience in a way that few films can. For the devotees of Terwilliger’s first film, One Six Right – this film is different. The screen is still filled with breathtaking shots, but they do not solely feature aircraft as this film has a far broader message to convey. That being said, the DVD, Blu-Ray or iTunes edition also comes with more than 40 minutes of special features for those yearning for more airborne footage. Alaskan flying, canary yellow biplanes over Africa and airliners passing close by – they are all there. Sometimes, we can lose focus when we stand too close. This movie eases us back and sits us down to view the modern-day miracle of flight in the most majestic of ways. This film possesses the power, the emotion and the romance that truly comes with living in the age of airplanes.